Written with an eye for the humour and pomposity surrounding the modern game, Justin Blundell brings the matches, goals and managerial spats of United's record-breaking season to life. From the Ronaldo transfer saga to the despair of defeat in Rome, this is an entertaining, minute-by-minute guide to the matches that really mattered. It contains the season’s best quotes from the likes of Ferguson and Benitez to Paddy Crerand and Mickey Thomas. Far from following the tired blueprint of stats and dry match reports, “18 times” is a book for everyone who lives and breathes United, not just on match day but every single day. More. Taking in every match Eric Cantona played for Leeds United, Manchester United and France, with summaries of his nomadic French career, The Complete Eric Cantona traces a legendary figure in Manchester United’s history. From his decisive role during the 1992 title run-in that helped Leeds land the last First Division Championship, to his arrival at Old Trafford 6 months later, his 1995 ban for launching a kick at a spectator and the redemption of almost single-handedly guiding United to the 1996 double, Cantona’s career was anything but dull. The Complete Eric Cantona is an ideal work of reference and offers a detailed insight into a remarkable football career. In “Memories...”veteran Manchester Evening News columnist Paul Hince looks back at a remarkable career that reached the highest levels in the ultra-competitive fields of football and journalism. After retiring from the game he then worked his way up to the heights of Manchester Evening News Manchester City correspondent and, later, became that paper’s first and only ‘Chief Sportswriter’. “Memories...” is a humourous yet poignant review of a remarkable career from one of the finest sportswriters of his generation. More..
NOW UPDATED WITH NEW LOCATIONS! Lyrically unique, Morrissey saw post-industrial Manchester differently. Where most recognised the derelict remains of a Victorian powerhouse, he saw humour, where others saw post-industrial squalor, he felt the frisson of romance. As a result Manchester became as much a part of The Smiths output as the guitars, drums and vocals. Unusually, these places still exist and provide the devotee with places of pilgrimage - could Manchester offer anything else? In the first edition of this guidebook, Phill Gatenby set out three tours covering 20 or more sites that either featured in The Smiths music or were fundamental to their development as a band - from early rehearsal spaces to the scene of their most memorable gigs. Now updated, Morrissey’s Manchester has added new places to visit, more lyrical references and more background information on one of the world's most influential bands. Sullivan ran with the Mayne Line Motorway Service Crew in the early 80s. Here he details how they gained a fearsome reputation nationwide. From St James' Park to Upton Park, the Mayne Line ruled British football, the most fearsome football mob during, hooliganism's 'Golden Age'. 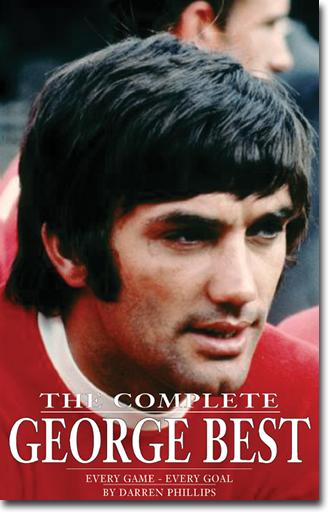 Widely regarded as the finest footballer ever produced by the British Isles, George Best's death in November 2005 prompted lengthy analysis of his career and his standing in the game, a debate The Complete George Best will seek to settle. Darren Phillips has painstakingly pieced together every game and goal scored by Best from his first team debut against West Bromwich Albion in September 1963. Jack Crompton is one of the surviving members of Manchester United's illustrious 1948 FA Cup winning side and the first to pen his autobiography. Jack served the club as goalkeeper, trainer and caretaker manager across five decades. His career between the sticks brought the first taste of glory to Matt Busby’s United, starring in a team that helped transform the club from pre-war also-rans to England's best supported club. As a 'keeper Jack was an automatic choice until the signing of Reg Allen and the emergence of Ray Wood in the 1950s. In From Goal line to Touchline, Jack talks candidly about the considerable changes in the game and refl ects on a career that took in glory and tragedy in equal measure. His unique insight into the methods and manner of Sir Matt Busby in particular are revealing, as he recalls a career that took him from the back streets of Hulme to the greatest stadia in the world. Cliff Butler is Manchester United's club statistician and former editor of the United Review. Cliff has written many books on the club including the Offi cial Illustrated History and the Essential History.